Here's a short homecoming dress that blends feminine style with bold details. In deep navy blue, this short party dress features embroidered-applique on the sheer mesh bodice and a floral-print short organza skirt. The sheer bodice has swirling lace well placed for a touch of modesty, while the high neckline, natural waist, and back are trimmed in floral lace. Pink roses and greenery are scattered across the fully-lined short organza skirt that flows away from the hips in a figure-flattering a-line style. 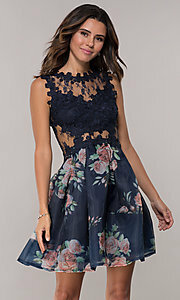 At under $100, this navy blue short homecoming dress is both affordable and beautiful for wedding receptions, sweet-sixteen parties, and hoco 2019 events.